England finish in second place, the top try scorers with 24, an attacking bonus point in four out of five of their games, but this second-half collapse was a horror show. However slick their attacking game now, as showcased in South Africa last summer, when they had similar problems maintaining electric starts, this tendency to then go missing is the biggest problem on Eddie Jones's to-do list. Wales had exploited it in Cardiff in round three, England imploding into a rudderless kicking game, which resurfaced here after a display in the opening half-hour as glorious as any they have produced this year. Which is saying something. They had muttered darkly in the week about a certain residue of ill feeling from the manner of their defeat in Edinburgh last season. They played here as if they meant it. The vengeance they have wreaked this season on their nemeses last year must make them wish they had lost to Wales then too. When Owen Farrell looped behind Kyle Sinckler, as if the latter were the fly-half, Henry Slade was released to give Jack Nowell a run. He cut inside four stationary Scots for that first try, and something of an exhibition was under way. Tom Curry could lay claim to the gong of England's player of the championship, and having just won yet another turnover he was on hand to finish a short lineout and drive for the second. Ellis Genge was on early, and he combined brilliantly with his fellow prop Sinckler to set up England's third, finished by a dummying lock, Joe Launchbury. 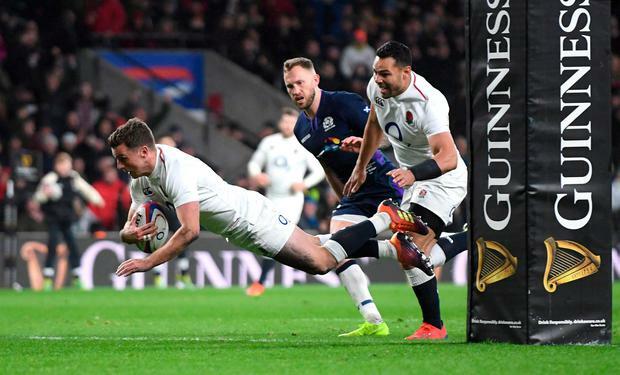 When Jonny May, who else, scored his 14th try in as many matches, finishing after England ran a brilliant counter-attack from their own 22, for that bonus point, the one-sidedness of the contest felt almost sickening. Scotland, ravaged by injury, have had a horrible Six Nations, and a first win here in 36 years seemed further away than ever. So utterly out-played had they been, a first try registered as little more than a consolation, even as early as the 35th minute, when Stuart McInally charged down Farrell on halfway and managed to see off May to race home - 31-7 at the break. 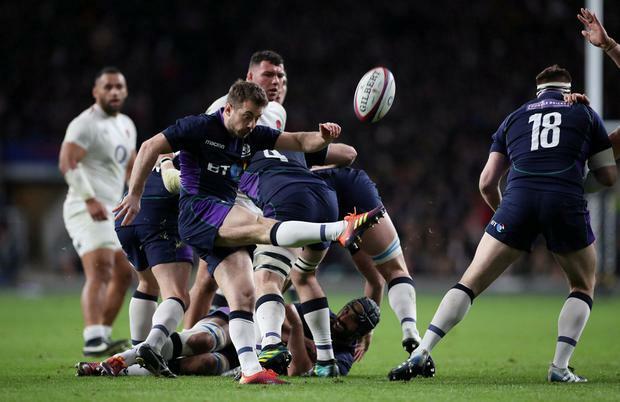 Scotland had found themselves adrift last weekend too, at home to Wales, if not quite so hopelessly, but they are a team of lavish attacking gifts. They spent almost the entirety of last weekend's second half pulling the Welsh defence this way and that, and they were soon doing the same here. Another stunning inside ball by Finn Russell set Sam Johnson away from a scrum, and at the next phase Sam Skinner sent Darcy Graham dancing to the line - 31-12. Twickenham coughed. Three minutes later they were starting to consider a full-on choke. Little Ali Price chipped forward from a scrum, gathered the bouncing ball and sent Magnus Bradbury galloping to the line - 31-19, and this was no longer funny for the home fans. In the 57th minute, Scotland hit a sweeter note again, Russell looping from a lineout and sending out one of his stunning long passes, which Sean Maitland gathered before sending the electric Graham past Elliot Daly, no less - 31-24 and Scotland had a bonus point. Now the situation was critical. The unthinkable was to follow next. Farrell, whose recent looseness is as concerning as it is uncharacteristic, threw an extraordinary pass straight from a scrum, which Russell was on to in a flash to streak clear for Scotland's fifth. His conversion from in front had Scotland level, with a full quarter still to play. England were shell-shocked, their second-half wobbles now confirmed as some sort of chronic condition. As in Cardiff, they retreated back within themselves, preferring to send the ball skywards at every opportunity. Scotland looked comfortable. In the 67th minute they had their first chance to take the lead. Farrell, again, was at the heart of it. Graham cleared the ball, and Farrell hit him without arms. This time, it seemed a genuine accident and was thus punished with just the penalty, which Russell lined up at goal, where it landed. He missed. No matter, with just five minutes to go, Scotland had what they have dreamed of for so long: a winning position against England at Twickenham. Billy Vunipola spilled the ball in contact, Simon Berghan's attentions proving too much, and Russell put Johnson through an enormous hole in England's midfield. He was away and picked a superb line through what was left of the defence to score between the posts. England's nightmare was complete. Less than five minutes and seven points between them and the relative honour of a draw. Farrell was off by now, so when England were awarded a penalty, Ford sent it to the corner to initiate one last chance to rediscover their attacking verve. In waves, England came, Nowell going close down the left. Curry and Genge supplied the link following a further breakdown, and Ford appeared from nowhere to slide through to the posts. The conversion was a formality, the humiliation avoided. The inquests, though, are only just beginning. 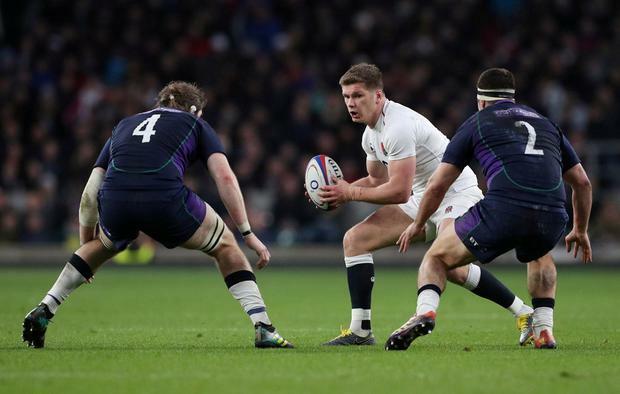 Scorers - England: Nowell, Curry, Launchbury, May, Ford try each; Farrell 4 cons, pen; Ford con. Scotland: D Graham 2 tries, Bradbury, Russell, Johnson, McInally try each; Russell 2 cons, Laidlaw 2 cons. England: E Daly; J Nowell, H Slade, M Tuilagi (B Te'o 77), J May; O Farrell (G Ford 70), B Youngs (B Spencer); B Moon, J George (L Cowan-Dickie 74), K Sinckler (D Cole 51); J Launchbury (N Hughes 74), G Kruis; M Wilson (B Shields 62), T Curry, B Vunipola. Scotland: S Maitland (A Hastings 68); D Graham, N Grigg (C Harris 57), S Johnson, B McGuigan; F Russell, A Price (G Laidlaw 57); A Dell (G Reid 45), S McInally (F Brown 57), WP Nel (S Berghan 61); B Toolis, G Gilchrist (J Gray 57); S Skinner (J Strauss 57), H Watson, M Bradbury.